It’s late in the evening on a hot steamy summer night. Come, join us on the patio. 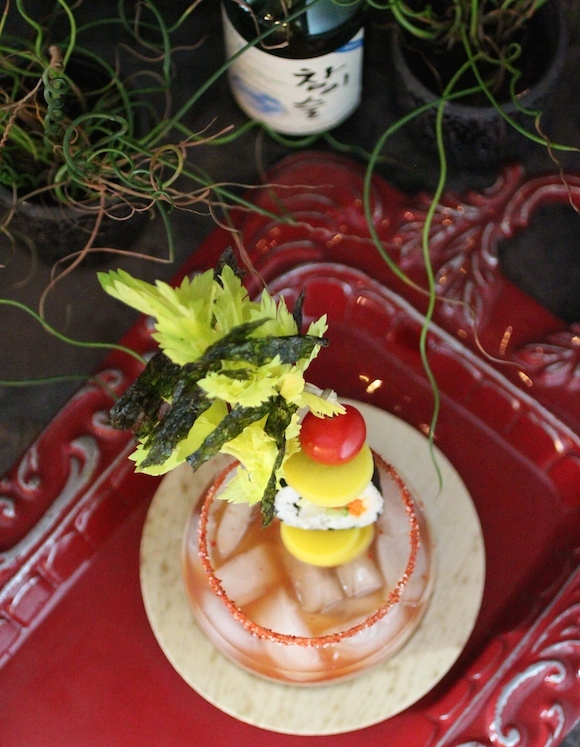 We’re having a cocktail that is sure to perk you up, and it’s served complete with its own anju (snacks enjoyed while drinking alcohol). 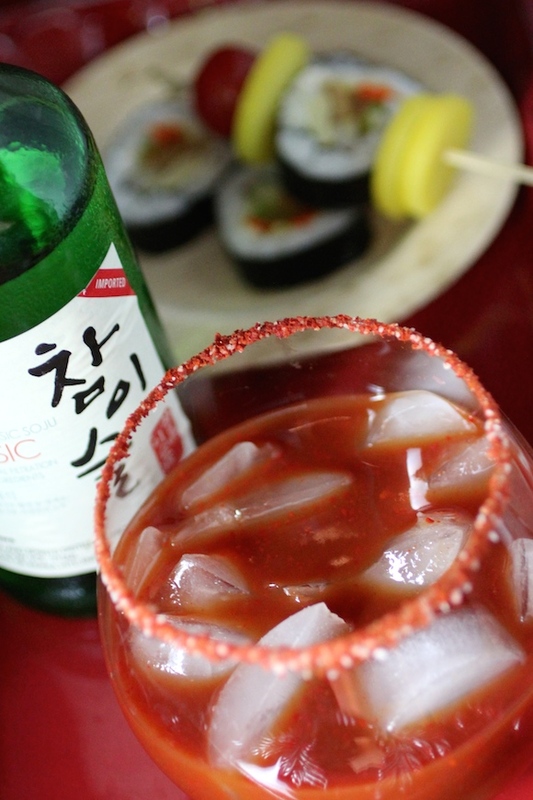 Our Korean Bloody Mary mix is a blend of soy sauce for salty-umami flavors, fish sauce for sour-umami flavors and depth, rice vinegar for a bright acidic note, and gochugaru, a Korean red chili powder that is definitely spicy but also has a balanced fruitiness, slight smokiness and depth of flavor from the sun-dried red peppers. The rim of the glass is coated with a smoky mix of gochugaru, smoked paprika, Kosher salt, and celery salt. 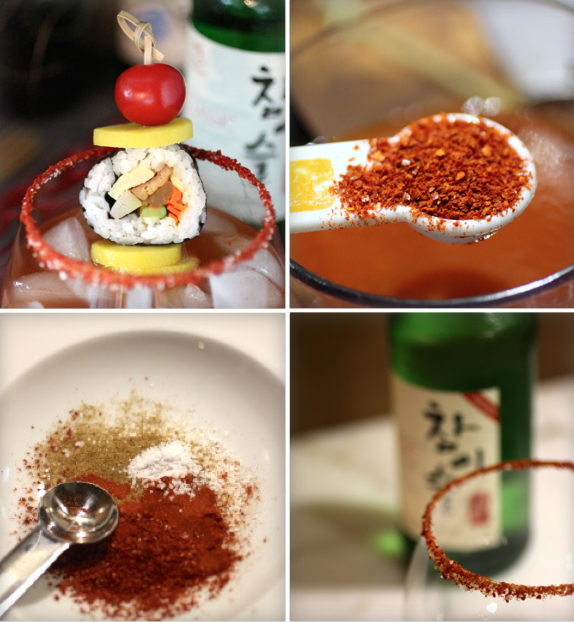 Enjoy smoky, spicy, salty flavors even before taking the first sip. Now for the anju: We have danmuji, a Korean yellow pickled radish that is sweet, sour and crispy. 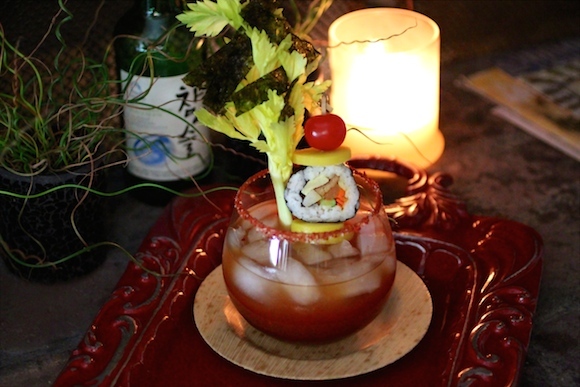 And while our Bloody Mary is garnished with that ubiquitous celery stalk, it is served with a twist! 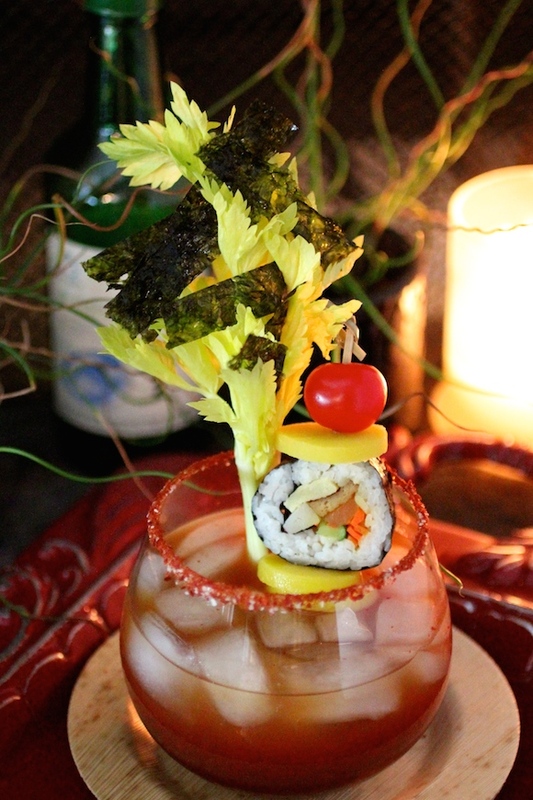 The “tree” is decorated with strips of gim, a seaweed that is roasted with sesame oil and seasoned with sea salt. 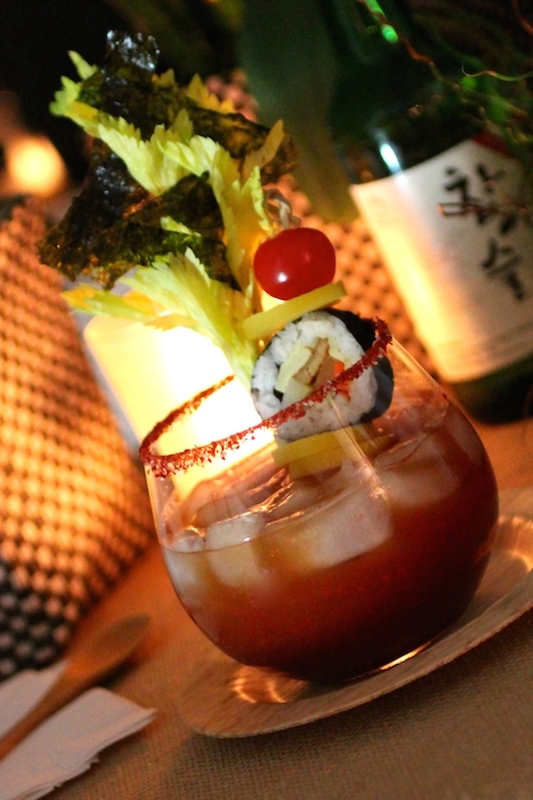 Munch on crispy strips of gim while sipping the spicy cocktail. 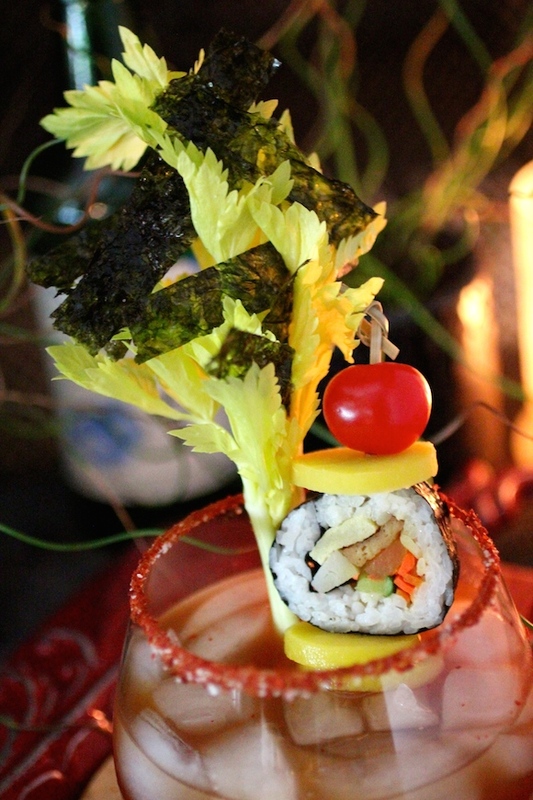 And finally, kimbap is a seaweed rice roll filled with yellow radish, spinach, carrot, egg, and fish cake. 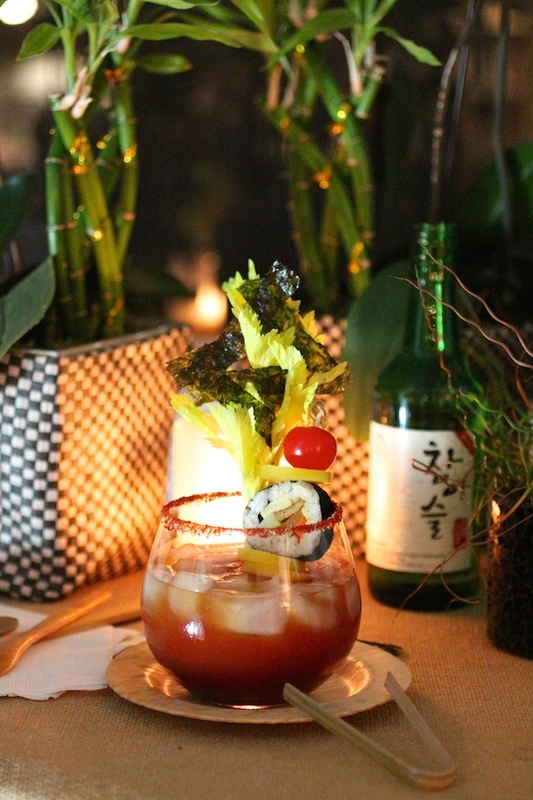 With so many flavors packed in a tidy little package, kimbap makes a snappy colorful addition to our Korean Bloody Mary. Combine all ingredients. Mix well and let stand 5 minutes or more to let gochugaru infuse flavors into the juice. Combine ingredients in a shallow bowl. Mix well. 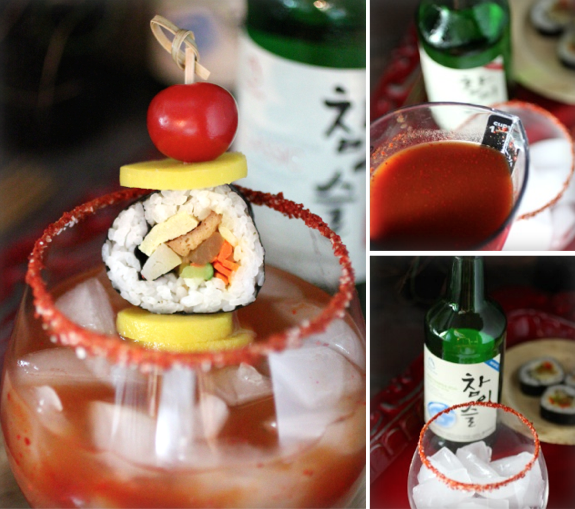 Rub the rim of a cocktail glass with lemon juice then dip the rim into the Korean Salty Rim mixture. Place plenty of ice into the glass. Add vegetable juice mixture then pour 1/4 c. cold soju over the top. Thread tomato, danmuji, kimbap, onto a skewer. Slice gim into strips. Place strips of gim between the leaves of the celery stalk. Still hungry for more snacks? 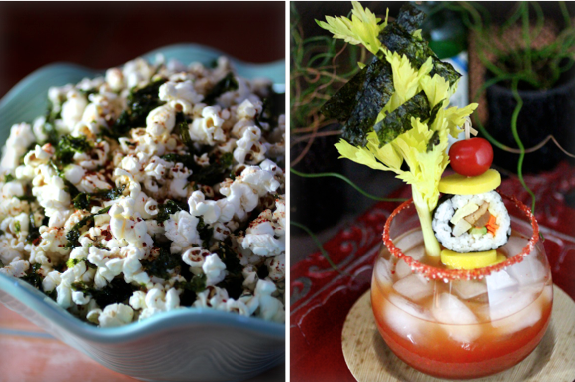 Try my Korean Popcorn recipe here. Summer Soiree is a season long franchise where Food Network editors team up with bloggers to share recipes about everyone’s favorite summer dishes. Be sure to check out the Pinterest Board with over 190,000 followers called Let’s Pull Up A Chair!